This page has been created to help keep all our customers up to date. The Marine Technical sales teams have collated industry articles and insights from around the globe and will continue to share information and update this page. To make sure you are on top of IMO 2020 register below for updates. From 1 January 2020 there will be a mandatory requirement to use marine fuels with a maximum sulphur content of 0.5% by mass. Don't wait for deadline day to get ship shape. 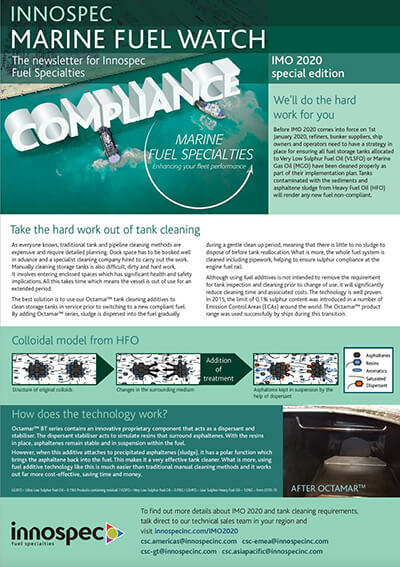 Now is the time to get your storage tanks and fuel handling system ready to accept compliant fuel. What next as MEPC 73 rejects proposal for an IMO 2020 experience building phase? Certain flag states have been calling for an experience building phase based around safety concerns of an unknown fuel, some are saying it is a thinly veiled attempt to delay 2020. Guidance on ship implementation planning approved by the IMO last week will assist ship owners in preparing for the use low sulphur fuels to comply with the 2020 sulphur limit. The 73rd session of the IMO’s Marine Environment Protection Committee has dealt with a huge amount of work this week. Here is a brief summary of points of particular relevance to IBIA’s members. sulphur which, following combustion in the engine, ends up in ship emissions. supporting our customers in their journey to 2020 and beyond. UK refineries are in good shape ahead of the looming sulfur spec change, which is set to cripple crack spreads on fuel oil and send middle distillate profits soaring. There is much noise these days surrounding IMO2020 and its effect on the commercial shipping sector moving forward. The captain of a cruise ship found to be burning fuel with excessive sulphur levels has been fined €100,000 (£88,500) in a Marseille court, the first such ruling in France. Everyone has a perspective on the direction and outcome of the forthcoming IMO 2020 regulations from the refiners to the vessel operators and everyone in between within the supply chain. 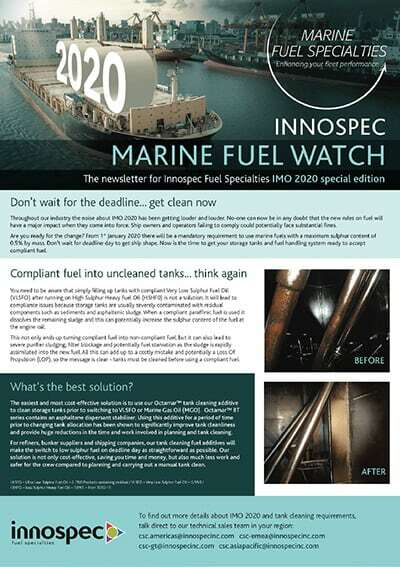 Michael Banning of Innospec highlights the importance of rigorous onboard fuel storage system preperation well in advance of IMO 202, including tank cleaning and the use of additives. 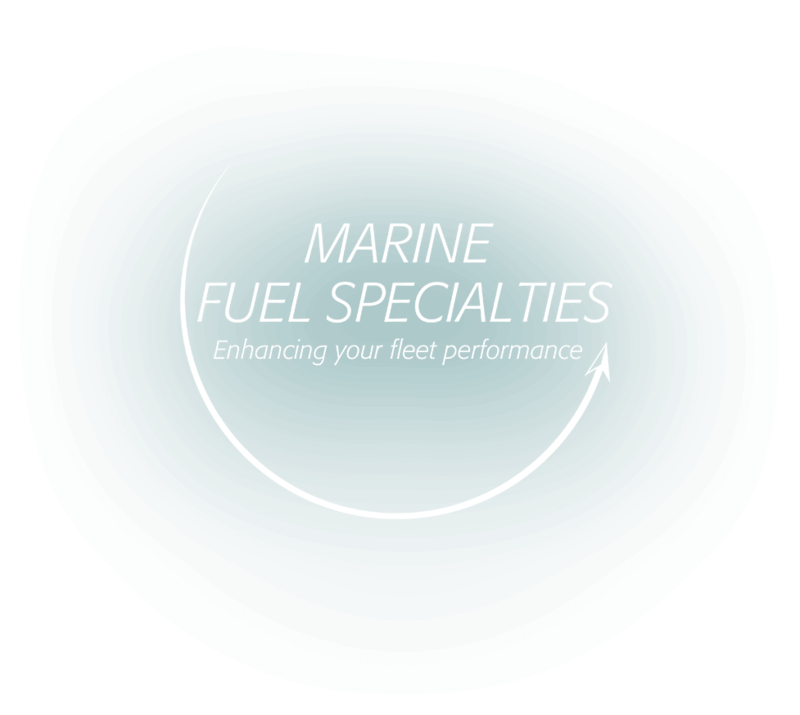 Michael Banning from Innospec's Marine Fuel Specialties division charts the development of its fuel additives, and outlines the properties of its new, independently tested, heavy fuel oil treatment, Octamar Complete. Michael Green of Intertek ShipCare and Michael Banning from Innospec review the findings of a follow-up study on the use of distillate fuel grades and lubricity issues - and also provide some insights into the uptake of recent revisions of ISO 8217. New statistics from the French Ministry of Environment would seem to support earlier US Coast Guard findings over loss of propulsion during fuel changeovers in emission control areas. Ian Crutchley of Innospec looks at the facts and discusses the role of fuel additives in mitigating the risks. Cold temperature behaviour in the marine distillate fuels has become a serious operational concern since the turn of 2015. Michael Banning of Innospec explores the reasons behind the issue, and reviews different techniques to assess cold flow properties. Octamar™ BT series contains an innovative proprietary component that acts as a dispersant and stabiliser. The dispersant stabiliser acts to simulate resins that surround asphaltenes. With the resins in place, asphaltenes remain stable and in suspension within the fuel. However, when this additive attaches to precipitated asphaltenes (sludge), it has a polar function which brings the asphaltene back into the fuel. This makes it a very effective tank cleaner. What is more, using fuel additive technology like this is much easier than traditional manual cleaning methods and it works out far more cost-effective, saving time and money. Receive more information on Octamar™ BT series, including product datasheets, presentations or to talk to one of our Technical teams in your region, complete your details here. A number of newsletters will be produced to provide more information around how to prepare for IMO 2020 in the most cost effective method. Download the latest here, or register for free copies below. To make sure you are on top of IMO 2020 register here for updates. By submitting this form you are agreeing to our privacy notice. © Innospec 2018. All rights reserved.